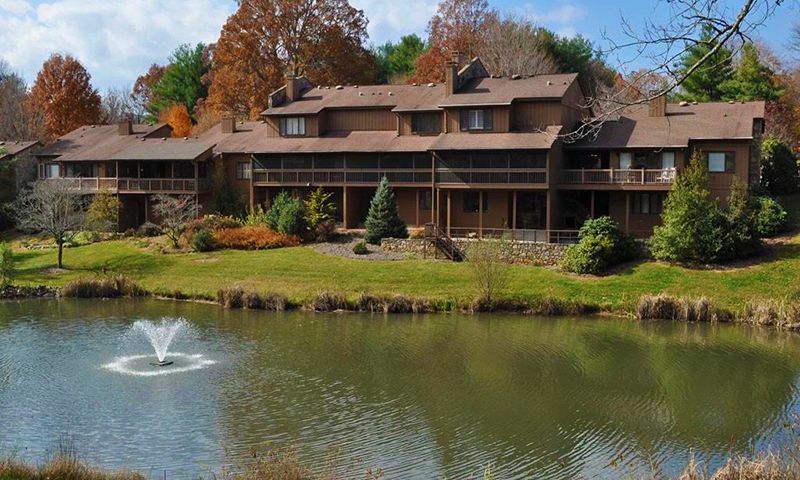 Crowfields is a 55+ community located in Asheville, North Carolina. This well-established community began in 1970 and now hosts 192 attached homes and offers the low-maintenance lifestyle that active adults seek. Homeowners enjoy living within Asheville, providing residents with big-city attractions and conveniences in their backyard. Recreational enthusiasts also love living in North Carolina's Blue Ridge Mountains. Living in Crowfields, with so much to do within and outside the community, gives several options to stay active for 55+ residents in Western North Carolina. At the center of Crowfields is the well-appointed clubhouse. Residents can discover a great new novel in the library or pick up a new hobby in the arts and crafts studio. Crowfields also gives active adults several ways to enjoy the comfortable year-round climate of Western North Carolina with an outdoor heated pool. There are also gardening plots to enjoy the area's long growing season. Scenic rivers, fishing ponds, and parks and natural space make Crowfields a beautiful and picturesque place to call home. Crowfields was developed between 1970 and 1999 and upon completion had 192 attached homes. These homes range in size from approximately 1,300 to 3,600 square feet and generally offer two or three bedrooms, two or two-and-a-half bathrooms, and parking throughout the community. Some homes include extra dens, gas fireplaces, screened-in porches, and ample storage space. These homes are arranged in clusters of four to eight, creating a friendly atmosphere between neighbors. Crowfields offers several events and activities to keep residents socially and physically active. Try a new exercise routine with Tai Chi or water aerobics. Get to know your neighbors with holiday events, social activities, and catered dinners. Day trips allow homeowners to explore the surrounding areas and Mah Jongg gives resident's the opportunity to have some friendly competition. Crowfields gives neighbors several ways to get to know each other and explore new interests and passions. Crowfields is located in Asheville, North Carolina. Directly across the street from the community is a shopping center that has several restaurants, a grocery store, and banks. The Greenville-Spartanburg International Airport is just over an hour away while, for shorter distances, Interstate 40 is a few minutes from Crowfields. Asheville Regional Airport is approximately six miles away for travel around the region. Just a few minutes away is The Oaks at Sweeten Creek hospital. Asheville is a perfect location for a mix of urban and recreational experiences. History buffs will love the Biltmore, a historic mansion reminiscent of Old World castles. The Appalachian Trail also passes through the area, giving nearly endless opportunities to explore one of the most breathtaking sights in the country. Golf courses, live theater, and world-class restaurants are just outside your door in Crowfields, a unique active adult community in Asheville, North Carolina. There are plenty of activities available in Crowfields. Here is a sample of some of the clubs, activities and classes offered here. Crowfields was developed between 1970 and 1999 and upon completion had 192 attached homes. These homes range in size from approximately 1,300 to 3,600 square feet and generally offer two or three bedrooms, two or two-and-a-half bathrooms, and parking throughout the community. Some homes include extra dens, gas fireplaces, screened-in porches, and ample storage space. Please Note: Not all floor plans are displayed below. 55places.com is not affiliated with the developer(s) or homeowners association of Crowfields. The information you submit is distributed to a 55places.com Partner Agent, who is a licensed real estate agent. The information regarding Crowfields has not been verified or approved by the developer or homeowners association. Please verify all information prior to purchasing. 55places.com is not responsible for any errors regarding the information displayed on this website.